I was looking at another Blog (I have a few minutes today) (http://glisteningwater.blogspot.com/) and I tried this.... Amazingly accurate. Give it a go as it's only 2 seconds of ... utterly insightful questions concerning you and your perceived place in the Universe on both a physical and metaphysical nature. You're super sensitive and easily able to understand situations. The right path is always clear, and you're a bit of a visionary. Michael Amon has been with the Rheumatology Dept at Westmead Hospital since 2001 where he was employed as a Research Assistant. In 2003, he enrolled with the University of Sydney to undertake a PhD project within this department. During his time with us, Michael has learned several techniques, including cell culture, in vitro T cell activation assays (antigen presentation, anti-body crosslinking, and superantigen activation), in vivo work (induction, treatment, analysis, and pain management of T cell mediated adjuvant induced arthritis in the rat), immunochemistry techniques such as Western Blotting, co-precipitations, 1- and 2-D electrophoresis, flow cytometry, magnet based cell separation strategies, gene expression analysis, as well as ELISA and radio-immunoassay development. Further to these biological techniques, Michael has learned how to apply biophysical techniques such as surface plasmon resonance and circular dichroism to further his research goals. Michael has also had the opportunity to teach laboratory techniques and methods to several medical doctors, as well as those in Master’s and Post-doctoral positions. He has been the first author of 3 manuscripts as well as co-authoring 3 manuscripts and a book chapter. Regarding Michael’s character, there is little to say besides that he is a genuine champion. While consistently succumbing to self-diagnosed lethargy, he has demonstrated an impressive knack for getting others to complete his work to first rate quality while he himself rarely completes anything above that of a solid second rate standard. Watching him work is as beautiful as watching someone born to lead from a distance as opposed to one capable of leading by example. Michael is an adequate researcher with a great future in middle management, or higher. As such, I have no doubt or hesitation in giving my full support to Michael, and strongly believe that he will make a significant contribution to any team that he may be on in the future. So why so long between posts you ask? Remember a little while ago (May to be precise), I was frantically trying to get an experiment set up to work properly to get some final results for my thesis... Well those experiments have been done and then came the analysis bit. There has been a girl hired to help run and analyze microarray data, but she's useless in this respect. But it's not entirely her fault, she was hired to run a system which they are going to buy in a few to several months or so, which she has knowledge of... But right now, she has very little if any knowledge on how to analyze data that you get now. I do not blame her for this. I am upset with her a little bit because she has been hired and "working" there for a few months now, and STILL doesn't know how to do this. And she complains of boredom. Hmmmmmmm. I'll leave you all to fill in the blanks here. But, where does this leave me... Simply put, writing cheques that can barely be cashed. I needed to have some results by this morning. So I have been learning how to use several computer programs with unfamiliar lingo to analyze my data... I finally found one that I have confidence in, but it required me to learn to speak in "R". So I learned to "speak" some of the lovely language of R on Tuesday night until 3:20am, then struggled to write the commands required to do what I wanted (I had to do the same analysis about 4 times over for scientific reasons that I will not bore you any more with) until 2am Wednesday, and did the analysis of everything (with ironing out of details) on Thursday until Midnight, so I could say something at a departmental meeting this morning. But, can you guess what me and Alex did on the weekend? Clever!! Ya, we went and saw Superman Returns! 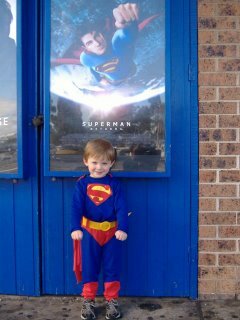 And I had to dress Alex up in his Superman outfit. He loved it! It's been out for a while so there wasn't alot of people there that day, so he was the only kid there, and so the only kid dressed as Superman. But that made it all the more cooler!!! As for the movie itself, it wasn't bad. I openly thought that Superman's casting was bad, but I was wrong. He did a great job; looked the part, played the part, and was the part. Kevin Spacey, while not his best work (he's genius in "Usual Suspects" and apparently in "K-Pax" although I have yet to see this, I trust my source as we have similar tastes), but he gives good life and evil-ness to Lex Luther. In watching this movie, and "rating" it, I think it's important to remember that there are certain rules which must be followed in any Superman movie, such as no (very little) blood or extreme violence (which are good things), happy endings, and that in the end, it's a kids' movie. However, it was a kids movie that I enjoyed watching, and would recommend to see to kill some time, and don't care about predictable story lines, reliance on special effects, and high quality dialogue. Reeves was Superman, and this (Brandon Ruth?) new Superman does him justice. To all my adoring fans, I apologize. I have nothing to say, either to bore or to bother you with. Pretty bloody tired right now though. But that's what staying up till 2:30ish in the morning and then having to go to work the next day will do to you. Almost a Doctor my a$$!!! A 4 year old would know better!!! Or at least would have the self-respect to crash on his own instead of force himself to stare blankly into a computer screen hoping that by staying up this late success in all things will be found!! Not going to happen dear. On a good (better) note, I think that I am out of the lab (besides training people) though. Yup, my trials and tribulations of May have (hopefully) ended. I am expecting to have a few very minor experiments to do, but I know a guy who is very good at this routine test, and he knows and is expecting me to come to him for help... So happy day for me.... Just a tired happy day.. Anyway though, if you have to explain a joke, it's a crap joke. But I find the Sarah Blasko song like that, but it sounds good. There's an emptiness in it that you want to fill with something, like guitar, or anything. But the emptiness created by the void of instruments, enhances the voice and lyrics. In my opinion, it's one of the best covers I have ever heard. Nothing short of genius; to come up with that rendition is inspired. It's easy to take a song, strip it down and play acoustically. But to sing it well, that's another level of ... goodness (tired and I can't think of good adjectives) but then to take everything away, add an odd bass line, a few other bits here and there, magic. Personally, I kind of think that they may have recorded more parts for the song, and then removed them in the final mix. Prince did that in one of his older songs, maybe 1999 but not sure. He had a lead vocal part and several background harmonies, but in the final mix, he ended up leaving only one vocal track (no background harmonies) but that one vocal track was a mix of the original lead vocal for one line, and then the next line would have been from one of the background harmonies... Clever stuff. It created a bit of an erratic vocal section, but for that song, it worked, and worked well. So, I think Ms Blasko may have done a similar thing. To round this post up, I told you I had nothing of value to say at the outset, so I won't apologize if you are not reading this wishing for your time back. Bones to pick and rumours to feed! It seems that at least here in 'Oz, this issue is receiving far too little attention. One reason for this may be because we are physically so far away from it (not "Western" problem maybe)? But I think it's probably due to the complexity of the situation. I wish I could say that I understood the politics and issues surrounding this, but I don't. What I know I have learned in the past few days from quick little internet searches. And even then, it's always more complex. I don't think either side is right, nor do I think either side is wrong. It's a massive gray area with disastrous consequences. Israel is paranoid about the Arab/Palestinian attacks (Fatah, PLO, PNA, and the list goes on), and the Arab/Palestinians don't feel safe living close to Israel (including Lebanon, Syria, Egypt), as Israel has a history of attacking Gaza/West Bank and very intrusive settlement, and also a history of pre-emptive attacks. And if rumors that the hostage soldiers (held in Lebanon) may be in transit to Iran are true, then things get worse. The US would likely jump at this opportunity to take out Iran, under the guise of Iran helping Hezbollah terrorists... and Iran has said that Israel better not attack Syria or it will be considered an attack on the "whole Islamic world that would bring a fierce response" (from the above link). So, in the back or our head, we have the US's declared Libya, Cuba, Syria, Iran, Iraq, and North Korea http://en.wikipedia.org/wiki/Axis_of_evil. Iraq has been "dealt with". North Korea is being dealt with within the confines of the UN with strong pressure from Japan. Israel - Lebanon war and the Israel - Gaza war may draw in Syria, which by Iran's own admission, will draw Iran in. Cuba and Libya. But considering the guise for which Iran would go to war with Israel saying that Israel has attacked Islam, would Libya join in? This is hard to gauge as Egypt is kind of in the way, and would Egypt get involved? Devil's advocate, ya sure, Libya will get involved, I mean how could they resist taking out the Israel? So now we have a war with a big chink of Arab states vs Israel... The US will become involved if this happens. I have no doubt in my mind. This post is not designed to say that the US is hoping for this. I don't think anyone in their right mind wants this kind of escalation. But if this continues, and continues to escalate like it does each time I check Google news... May God have mercy. Personally, I think that the only way out of this, is for the Lebanese (and Syrian) government(s) to force Hezbollah to release its hostages. This fixes short term problems and the potential for WWIII, but the process should continue at break-neck pace to establish something like what Bill Clinton suggested near the end of his Presidency. Israel and Palestine authorities NEED to trust eachother and work together and RECOGNIZE each's right to be. I know this is difficult considering Palestine's leader (Hamas) are a recognized terrorist group who's mandate to never recognize Israel... (Israel feels the same about them so they're equal on this front). But if they could agree to this, and work together to stop (minority) factions from suicide bombings and stop letting these bombings interupt the peace process, then maybe they could move forward. 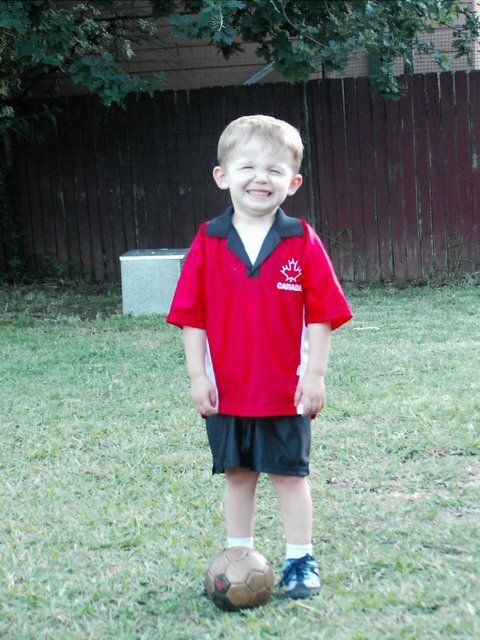 Well, my boy Alex is finally a full-fledged Canadian!!! 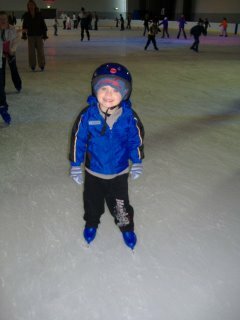 He is 3 and a half and can stand and walk on skates!!! Ya, I'm a proud dad. Alex didn't take too long to be able to stand up on his own either, so I was pretty happy about that. Not so happy about the sore back I got by the end of the 2 hours. He like going around the rink fast, which meant that I had to hold him while I was hunched over... Watch the video to see what I mean. But he absolutely loved it. I would like to try to take him more often so he could become a skating champion of the world, but it cost us $30 for me and him (including skate hire). Imagine that, 2 hours of skating for one adult and one child = $30. Well, that's one dream that won't get lived out. I've probably posted too much for today, so bye bye my adoring fans!!! I filled up with sorrow last night when I found out. I found out last night, a bit later than probably Tammy for eg (who is knowledgeable regarding children’s programming) that “cookies are a sometimes food”. Translation: Cookie Monster now needs to eat good food too, like vegetables, because he is setting a bad example for the kids who believe that whatever Cookie Monster does, they should do. 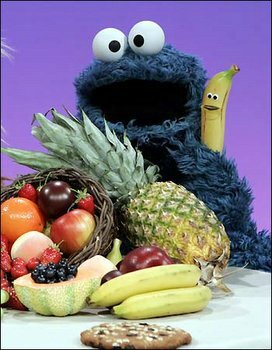 I guess this is good, kids are learning to eat well from a blue puppet on Sesame Street named (inappropriately now) “Cookie Monster.” I mean, it IS after all Cookie Monster’s fault that America is as fat as it is. I know as a child, looking at that blue monster was like looking in a mirror, I knew that what he did represented what I should be doing. 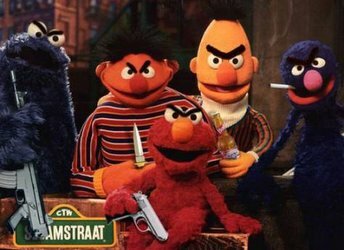 Bloody hell, Cookie Monster is the root of all that is evil in this world!!!!! Obviously joking here. To a degree. I don’t remember even once having eaten a cookie after seeing Cookie Monster eat his. I think that most (if not all) kids can discern the difference between a puppet and themselves. Alex (3.5 year old son) can tell you who is a boy and who is a girl just by looking at their faces, so I know that it’s a stretch of the imagination to believe that he can tell the difference between a blue monster puppet and a person. Jeez, it just hit me that I took him to see the movie “Cars” the other day (not a bad flick) and that they drank gasoline!!!!! Maybe Alex will now start drinking gas because he liked the cars (Lightning McQueen in particular) in that movie. Damn Disney!!! This tragedy points to a real problem facing westernized society. Don’t get me wrong, I agree with this in moderation. Equality of the sexes, inappropriate behavior in the workplace etc.. but these all stem from a basic understanding of respect. The Cookie Monster eating cookies has not hurt anyone. Everyone loves a good cookie every now and then, and why the powers that be use the television as a media for entertainment instead of encouraging its usefulness as a babysitter? What about “Where is Thumbkin?” Bec informs me that it has now been officially changed from “How are you today sir?” to “How are you today friend.” Sexist? I don’t see it. What’s so bad about labeling something a boy or a girl? I don’t mind it people say “That Mike, he’s a (fill in the blank with adjective(s) of your choice) guy.” As opposed to some generic thing like “friend.” What have we come to? There are heaps of examples of this type of garbage where people in power think they are bettering society by treating everyone as a generic, but they’re destroying what makes us great, that we are all different. So, to propose a solution, albeit an extreme one, bring back political incorrectness!!!! Bring back the “Beer Wench” (http://www.beerwench.com.au/), keep the women barefoot and pregnant in the kitchen, and kill the metrosexual. Or simply revel in our diversity and cherish the difference needs of our society, be it an insatiable desire to eat cookies, to call one’s thumb “Sir,” and support chivalry, let a man be a man and a woman a woman. A lovely Germen girl who was working in our lab for the past year or so gave me this book as a parting gift. The Swarm by Frank Schatzing. It's written originally in German, but has translation rights sold globally. It's also a bloody big book at about 900 pages, small print, and 2 medium sized pictures. So there's a lot of reading involved. Perfect for the crappy +2 hours/day I spend on the train coming to and from work. I'm not going to give anything away about the book, but basically, I really enjoyed it. I found it engaging and enjoyed how it built up tension, particularly in the 1st third to half of the book. There's science stuff in it, but I think it should be manageable for most people, as it is an international best seller, and I don't think there are that many scientists who could possibly make hard-core science books reach that status. I found the book a bit preachy at the very end though, but this in itself gives insight into the author's stance on reality, pop-culture views on religion, and our (human's) place in this world at least. Based on the book's popularity though, these views may be shared with a larger populace. Not to take away from the rest of the book though, it's a great read. And I would probably put this book up there with things I think people should read. Not because of any dogmas, or controversial issues being challenged (Da Vinci Code anyone? ), because this book doesn't aim for that. It's just a really good read. Absorbing, interesting, and most importantly for this genre, enjoyable. Starts off slow with a few people disapearing while fishing in some small south american countries, then the discovery of some interesting worms feeding on continental slopes in the north Atlantic off Europe, whales disapearing for a little while... A series of non-events slowly become marginal events, and then build up to all-hell-breaks-loose events. Things get crappy and we have to deal with it somehow. I don't really want to give away any more because my ignorance in my initial reading helped make this book better for me, and I wouldn't want to take that away from you, because I know that you will ALL go out and buy/read this book mainly because I am telling you to, (I have a massively over-inflated view of the importance and effects of what I say on other people, except for Alex and Rebecca though, they could generally care less). There's a good cast of characters, and I didn't forget their names at the end of the book, which means they all play some significant role and were dealt with by the author in such a way as to allow someone such as myself (who still struggles with which hobbit went to Gondor with Gandalf and which stayed at Rohan, I know it's either Merry or Pippin, but which one? and I've read the books twice, and seen the movies at least twice) to remember each's role/name/allegiance. I'd give this book a 5 out 5. For comparison though, I would probably rate The Da Vinci Code a 3 out of 5 because the only thing I enjoyed really out of it was the proposal that Jesus was romantically involved with a woman who may have had a child. The story itself seemed to exist to propose this theory to mainstream media. It was a puzzle/chase book with little character development and I did not get absorbed by the plot or feel anything for the characters. In contrast, I felt for some of the characters in The Swarm, I became engrossed in the story. Enjoy your weekend oh People of the Blog. Nup, not going to get sentimental here. another time maybe, but not here. This is a pic of him on his 3rd birthday. Do the click to enlarge bit and look under his eye... Can anyone say "pick-axe"? And then say "Lifetime of guilt." Honestly, I did not forget about my lovely little sister's birth day. I was going to post something for her tomorrow, when it's actually July 4th in Canada. But show posted a comment, and I am happy. Billy Talent. I sing their praises oft, and very few people have heard of them. I still listen to their first album and know all the lyrics etc etc. I was .. enlightened to their existence and musical prowess when my parents, Jennah and Philip came to visit us in 'Oz. From this, I joined their fan club thing on the net so I would know if they ever came here, and when their next album was released. So I do know that they have another one out, that they had an e-mail out for people to show up down-town (Toronto I think) and be in the video, and that they had a special show thing they did at MySpace.com awhile ago. I'm not into all that extra crap though, so I didn't waste my self-proclaimed precious time looking for paraphenelia, but I can't wait to here their new album!!! Jennah, I'll take you up on your offer to post it down... PLEASE PLEASE PRETTY PLEASE. Note to everyone regarding this out-of-character post. While I will not be making a habit of replying to comments unrelated to my original posts (as I feel that's what e-mail or the phone is for) it's Jennah's birthday, and I wanted to profess my love for Billy Talent.... I'll have your baby!!!!!!! 24 is back on. I only wish that I could share the enjoyment and pleasure that wells up inside me when I first heard that. I love that show. Rebecca hates it, so watching it gets tricky, even more so when it conflicts with another of our favs, NCIS. Ya, it's another cop-ish show of cop-ish people tracking down murderous punks... But what do you do? We like the interactive dynamics of the people involved. It's like a close-knit family and it makes us laugh sometimes. So I tape "24" to watch it later. I guess it's like a soap opera in its addictiveness, with the exception that if you miss an episode, you genuinely miss something. Like Kiefer Sutherland killing another bad guy, or finding out that he's being double-crossed by one of his own because "CTU has been compromised". Ya, I know, but I like it! Big Brother... Where do I start here... Although I openly admit and acknowledge that this show is probably one of the 7 sings of the apocolypse, we do watch it. There's nothing else on, and it's timing is such that it is right after we finish supper, and want to sit down for a minute (30 minutes as it turns out to be daily). But genuine controversy has occured!!! 2 housemates got the boot Sat or Sun for "sexual misconduct" in the wee hours of Sunday morning (I think it was). Don't know many of the details, but needless to say, alot of people in high places are calling for an axe. But I would like now to begin a new section of this blog, "Restaurant reviews"
And a happy Birthday to you Ellen, should you read this. Although I know that answer is no.